saurav-nav: Data Upgrade to Microsoft Dynamics NAV 2018. In this article, we will discuss data upgrade to NAV 2018 from NAV 2017 (Cronus Database). Steps will remain same for the NAV Version 2015 and 2016. * Read at the End of article. First thing first - How many steps to upgrade to NAV 2018? 1. Use the Microsoft Dynamics NAV Development Environment to build all application objects. From Tools - Build Server Application Objects. 2. Unlock all application objects. Filter - Locked True in object designer. Select all Locked Objects and From File Select Force Unlock. 3. Synchronize the database schema. From Tools - Sync. Schema For All Tables, with validation. Task 2: Create a full SQL backup of the old database on SQL Server. Replace with Tenant Id, If not multitenat then use default. As this is not providing the complete Name of the extension, we can run the table - 2000000153 "NAV App Installed App". Replace and with the name and version of the Extension V1 as it appeared in the previous step. In the development environment, open the old database, open Object Designer, select all objects except tables, and then choose Delete. * Select All in Object Designer and Mark All Objects. * Select tables in Object Designer, select all and Un-mark all tables. * From View Select Marked only and select all in Object Designer. * Delete all Objects (marked Objects). Task 7: Clear Dynamics NAV Server instance records from old database. Replace - [My NAV Database Name] with NAV Databsae Name. Task 8: Convert the old database to the Microsoft Dynamics NAV 2018 format. 1. Open NAV 2018 Developer Environment as administrator. 2. 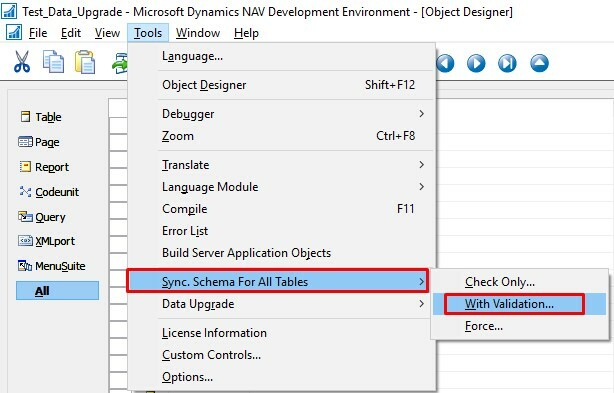 Open old database to Dynamics NAV 2018 Developer Environment. 3. Follow the conversion instructions. ** Do not run table synchronization. Task 9: Import the upgraded application objects and upgrade toolkit objects into the converted database. ** Do not run table synchronization (Select Later if asked). 2. Import Upgrade Toolkit Object in Database. Task 10: Connect a Microsoft Dynamics NAV 2018 Server instance to the converted database. 1. 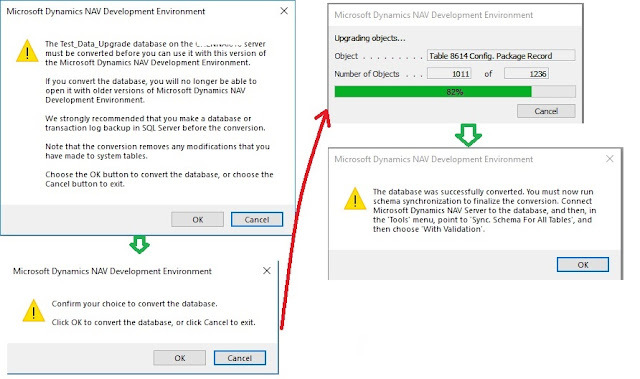 Increase the SQL Command Timeout setting for the Microsoft Dynamics NAV Server instance. Task 11: Compile all objects that are not already compiled. 1. Filter Objects with compiled false. 2. Compile objects with Synchronization Schema Later. If you get errors on the following table objects, use the Object Designer to delete the objects because they are no longer used. When you delete following table object, in the Delete confirmation dialog box, set the Synchronize Schema option to Force. Task 12: Run the schema synchronization on the imported objects. From Tools - Sync. Schema for all Tables - With Validation. Task 13: Run the data upgrade process. On the Tools menu, choose Data Upgrade, and then choose Start and follow the instructions. Task 14: Delete the upgrade objects. Filter Objects with Version Tag - @*UPGTK* and delete objects with Force. Task 15: Import upgraded permission sets and permissions by using the Roles and Permissions XMLports. Task 18: Publish and install/upgrade extensions. Publish-NAVApp -ServerInstance DynamicsNAV110 -Path "D:\NAV2018\Extensions\Ceridian\Ceridian.navx"
Publish-NAVApp -ServerInstance DynamicsNAV110 -Path "D:\NAV2018\Extensions\EnvestnetYodleeBankFeeds\EnvestnetYodleeBankFeeds.navx"
Publish-NAVApp -ServerInstance DynamicsNAV110 -Path "D:\NAV2018\Extensions\ImageAnalysis\ImageAnalysis.app"
Publish-NAVApp -ServerInstance DynamicsNAV110 -Path "D:\NAV2018\Extensions\MSWalletPayments\MSWalletPayments.navx"
Publish-NAVApp -ServerInstance DynamicsNAV110 -Path "D:\NAV2018\Extensions\PayPalPaymentsStandard\PayPalPaymentsStandard.navx"
Publish-NAVApp -ServerInstance DynamicsNAV110 -Path "D:\NAV2018\Extensions\QuickBooksDataMigration\QuickBooksDataMigration.navx"
Publish-NAVApp -ServerInstance DynamicsNAV110 -Path "D:\NAV2018\Extensions\QuickbooksPayrollFileImport\QuickbooksPayrollFileImport.navx"
Publish-NAVApp -ServerInstance DynamicsNAV110 -Path "D:\NAV2018\Extensions\SalesAndInventoryForecast\SalesAndInventoryForecast.navx"
As we all know NAV 2013 and NAV 2013 R2 are no longer active products from Microsoft, there will have no more cumulative updates for these versions and also there will no updates in active products (NAV 2015 and higher) for upgrade toolkit from NAV 2013 and NAV 2013R2. NAV 2013 and NAV 2013 R2 end of mainstream support end after the release of NAV 2018. Link - End of NAV 2013 and NAV 2013 R2 Mainstream Support. So if you are planning to upgrade to NAV 2018 Initial Release, CU0, CU1, and CU2 then the number of data migration steps = 1. 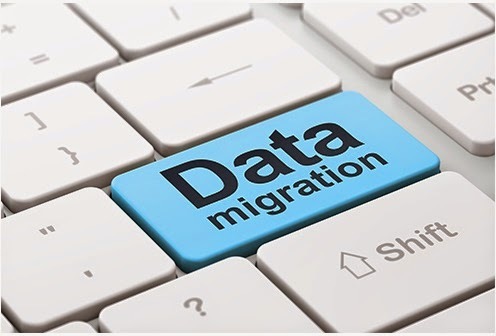 But if you are planning to upgrade to NAV 2018 Cumulative Update 03 or latest cumulative release in future then Number of data migration step = 2. Link - End of one step upgrade from NAV 2013 and NAV 2013 R2 to NAV 2018. If you have any questions, I will be happy to answer those if I can. Please also let me know your views.